Good afternoon everyone. Earlier today, I wrote Dilemma: Spend $15,000 on Chase World of Hyatt Credit Card to Earn Extra Free Night Certificate? In that post, I mentioned that I did a mini App-O-Rama. 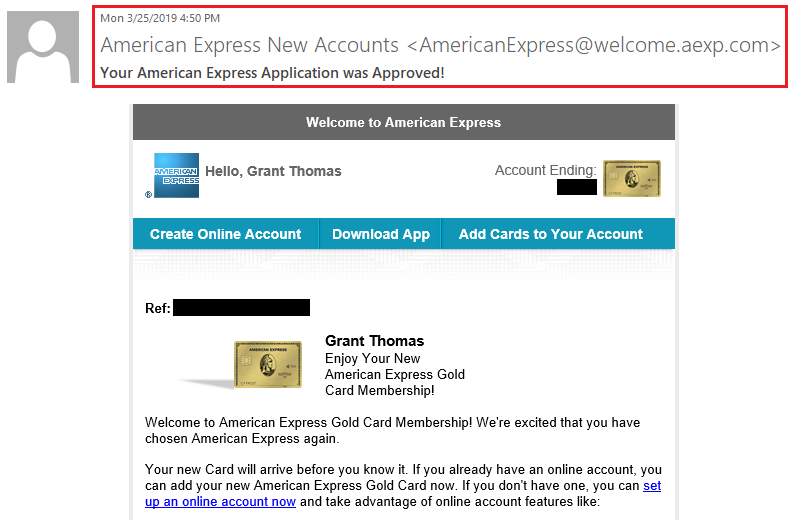 I applied for 4 cards and was instantly approved for 1: the American Express Gold Card (my referral link). Hopefully the 3 other pending credit card applications come back as approved. I will keep you posted on those results in the next few weeks. 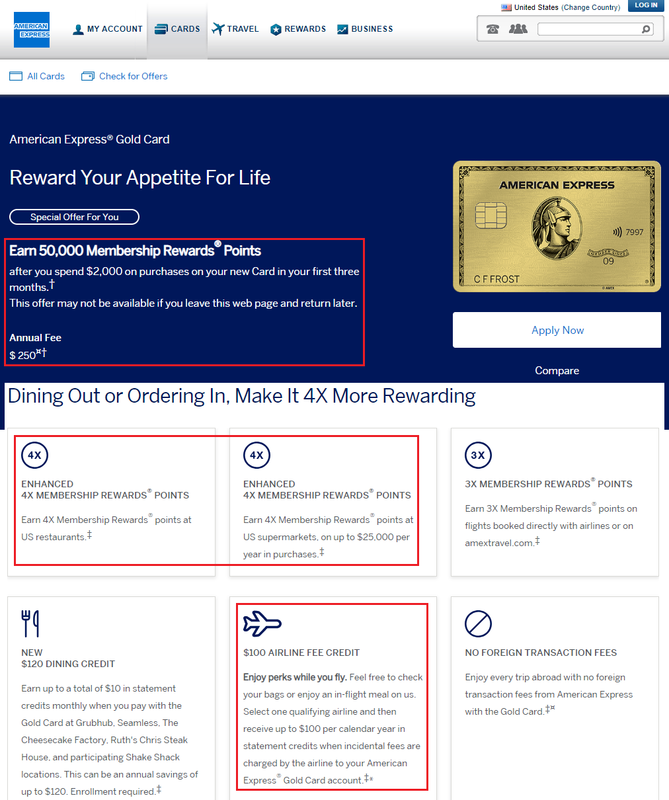 Anyway, I liked the American Express Gold Card for the juicy sign up bonus (spend $2,000 in 3 months and get 50,000 Membership Rewards Points), 4x Membership Rewards Points on restaurants & grocery, $100 airline fee credit, and $10 monthly dining credit (which I plan to use at Grubhub to pickup lunch once a month). Unfortunately, I am not very excited about the $250 annual fee. Much to my surprise, I was instantly approved for the credit card. I was also offered the ability to view my card number now. Yes please! American Express gives you 3 minutes to save your card number, so I took a screenshot and copied the card number to a notepad file. I then added my new card to my Apple Wallet (and used it twice last night). I also received an email from American Express stating that I was approved for the American Express Gold Card and that the card should arrive soon. I am hopeful that the 3 other pending credit card applications will turn into approvals, but until they do, I will work on meeting the minimum spending requirement on my new American Express Gold Card. If you have any questions about the American Express Gold Card, please leave a comment below. Have a great day everyone! This entry was posted in Airlines + Miles, Credit Cards, Hotels + Points and tagged American Express, AMEX, credit cards, Free Stuff, Membership Rewards, Travel Credit Cards. You get $100 airline credit per calendar year. So why are you crying about the $250 annual fee? I want to change my platinum to gold. Will I keep the same card # and history? Specifically will I eat a 5/24 slot? Will I get new $100 airline credit per year? I have already used the platinum airline credit for this year. That’s a good point about the 2 x $100 airline credits. I’m not sure if I will keep this card long term. Your card number should stay the same, credit history should stay the same, and it will not ding your 5/24 score since you are not applying for a new card. Based on when your Plat AF was billed, you will be billed a prorated AF when you convert to Gold. Once you have converted, you should start receiving all the benefits, minus the sign up bonus. You can also double check everything when you call AMEX. Ok thanks. I will switch when my new annual fee posts. So should be all clean i think. You might be better off converting before your AF posts, but waiting will work too. What’s your plan for the $100 airline credit per calendar year? I did the AA gift cards last year but I heard they’re being coded as GC since! $100 SWA eGC have always worked for me. Any idea if you can apply for the new gold if i had the old gold 5 years ago? cant find and DPs. Great question, it would depend if AMEX has a record of you having that CC in the past. You can certainly apply for the card. You will probably be denied the signup bonus if you had the card within the last 7 years, but they will still give you the card. They will tell you before you submit your application if you are not eligible for the signup bonus. Yes, go through the application and see if you get a popup alerting you that you had the card in the past and that you are not eligible for the sign up bonus. I’ve found the grubhub option be be pretty useful for the $10 dining credit. There are an awful lot of restaurants on grubhub, including some pretty good ones. I always order through the app then choose to pick up the food myself rather than pay for delivery. Good idea! I work in SF, so I am sure I can walk to many Grubhub restaurants near my work and pick up lunch. only offering me 40K miles from your link. What’s up?